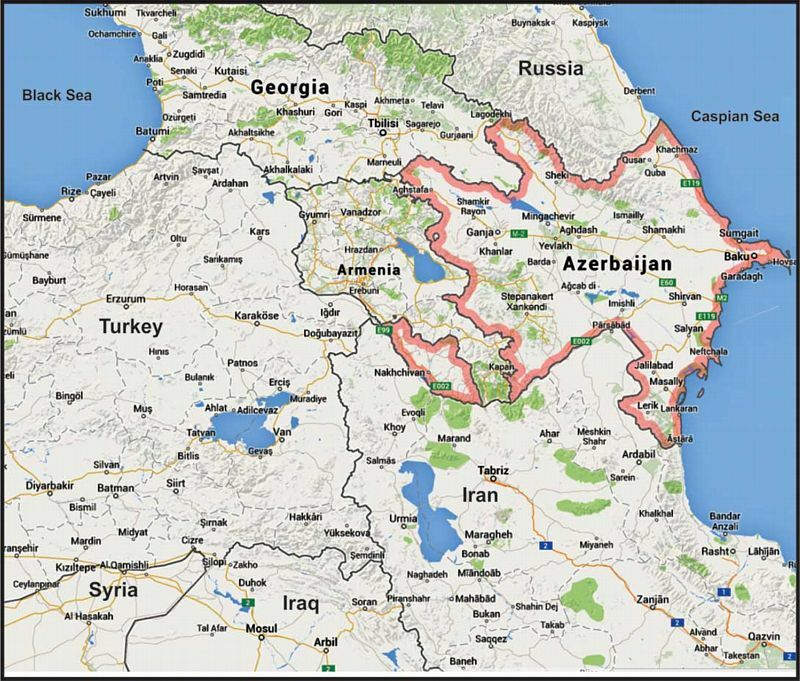 Azerbaijan and its neighboring countries. The state was invaded by Soviet forces in 1920 and remained under Soviet rule until the collapse of the Soviet Union in 1991. 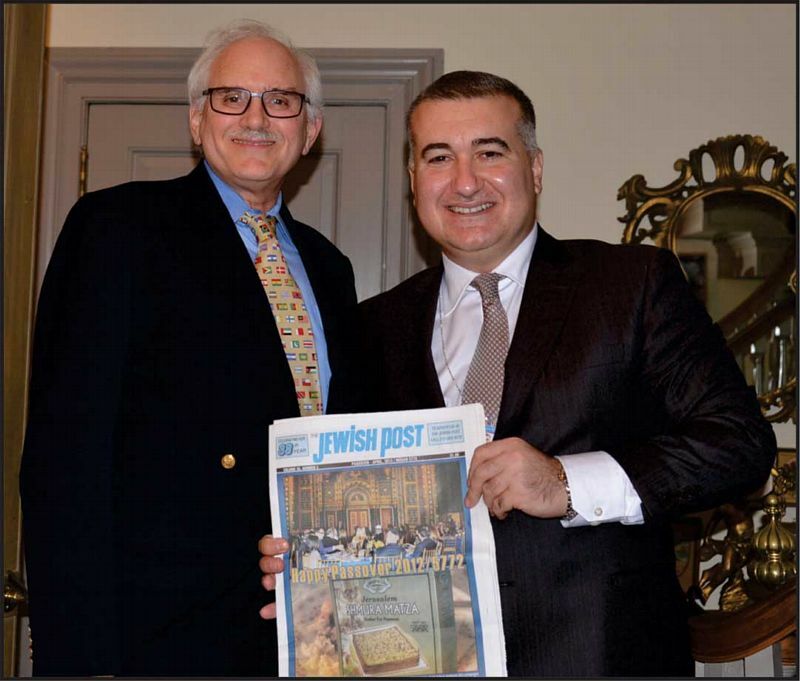 Recently an exclusive interview was arranged between Elin Suleymanov (ES), the Ambassador of Azerbaijan to the Unites States and Henry Levy (HL), the Editor and Publisher of the Jewish Post. We invite you to read the enlightening account of what transpired. ES: Azerbaijan is the first republic in the Muslim word, established in 1918. It provided for equal voting rights to all citizens, including women- far ahead of many other nations. Our culture celebrates our music which is very distinct and unique, such as the world famous chants of Mugham, and our intellectuals, among them Baku-born Rostropovich and the former World Chess Champion Garry Kasparov. HL: Azerbaijan declared its independence on October 18, 1991and Israel in December of that year was one of the first countries to recognize the new state. ES: I think our relationship with Israel goes very far back and I think it precedes the existence of the State of Israel itself, so I think the relationship which existed between the two peoples actually helped and is the core of the relationship between the two nations. It is a pragmatic relationship that is also neighbor to neighbor based. Today we have an exhibition at the UN Secretariat, called “The Land of Tolerance” and one of the photos is of a national Azerbaijan hero, Albert Agarunov, who is an Azerbaijani Jew who died in the war with Armenia in 1990s fighting for Azerbaijan. He was a tank commander so he was among the heroes of our resistance. In 1918, we also had one minister in the government, the Minister of Health, who was ethnically Jewish, so there was always this attitude of inclusion, which by the way, was not just exclusive to the Jews. Now it has developed into a special relationship because of Israel, I think. For example, our Foreign Minister arrived here for the United Nations General Assembly meeting on the 21st and heard the speeches from Iran, Obama and others, followed by some bilateral meetings. During the first day he met with Jewish organizations and his first dinner was with the American Jewish Committee. David Harris, AJC’s president was the recipient of the Order of Friendship by our president, Ilham Aliyev, which is the highest honor awarded to a foreign citizen. Such honors do not happen very often nor do people hear about them. It is not reported on CNN, nor in the media. One only hears about another bombing or another attack rather than good things. So think about this, not only does the leader of Azerbaijan award an American public figure who leads a major Jewish organization, but one of first official acts of our Foreign Minister upon arriving for the annual UN General Assembly for foreign leaders is to break bread with the AJC. HL: I read that President Aliyev indicated the relationship with Israel was like an iceberg, with 9/10 of it appearing below the surface. That is quite different from what you are describing now because it seems very much in the open. ES: I wouldn’t go so far as to say that. We are not hiding our relationship and are not ashamed of our relationship with Israel. Of course there are aspects dealing with security issues that are not openly discussed. We are a proud nation with a Muslim heritage, we are an active member of the Organization of Islamic Cooperation and we have strong relations among the Muslim community. At the same time we believe that the Israelis are our friends. We fundamentally do not see a contradiction in being a proud Muslim country and a friend of Israel. Now, if we disagree with the Israelis or they disagree with us, we tell them. Regarding the Palestinian issues we sometimes have disagreements, but if such disagreements exist they are disagreements which could be and should be discussed. The most important aspect of dealing with any disagreements is communication. We have been able to do that so far and so in a friendly manner we can sit down and try to iron out differences through friendly conversations. Every country experiences such things. HL: I understand that Israel receives about 40% of its oil from your country and has become an important trading partner as well. ES: The economic relationship is very good because of the oil connection and the pipeline which terminates at the Turkish port of Ceyhan. There is also substantial trade in natural gas now that one of our subsidiary companies drills offshore for gas. HL: Did Azerbaijan try to play any role in trying to smooth over the difficulty between Israel and Turkey as a result of the “Flotilla” incident given your close relationship with both countries? ES: Israel is close partners and friends to us for centuries and because Azerbaijan has a sizeable Jewish community. With Turks we are brothers and sisters. It is like one nation with two states, so we are very culturally close. We respect both the Turkish aspirations and their views and those of the Israelis, and we told them both that they should work together. It is in Azerbaijan’s interest for Turkey and Israel to be partners. We are not that strong or large to impose our position but that is something that has to come from inside both countries. We have always indicated to each of them that whatever strains may exist in their relationship, neither side benefits. It is not in the interests of either one to promote any kind of friction. The calmer either side is the better for them and for the region. In our part of the world they have common, shared interests. HL: (in Turkish) Do you speak Turkish? ES: Yes. The Azerbaijani language is a Turkic language and it is spoken in several countries in the area. HL: When I was younger, I lived for two years in the central Anatolia section of Turkey and taught English in a Turkish middle school as a member of the Peace Corps. In fact when the Flotilla incident caused an eruption of the Turkish Israeli friendship it was very troubling for me. Several Turkish organizations in New York contacted me to facilitate more open communication between them and the Jewish community in New York and we did just that. ES: I think in a way what we saw was that the media had a good effect in spreading news. But sometimes it can be negative. I know of more people that spend more time communicating with Facebook and Twitter then in real life. But with people you have to sit down face to face with the, look at them and talk with them. Social media is easy. I think it had an effect that our Turkish friends and our Jewish friends forgot what it’s like to be in actual communication with each other and both sides used stereotypical statements but when you actually see people sitting down together you see how much they have in common. This goes to even the larger picture of Turkey and Israel. “A” there is an interest based relationship where you have so much in common you benefit from working together. And “B” there is the centuries old tradition – you have Jewish leaders in Turkey long before Europe accepted either Turks or Jews. When we saw the leaders of the Jewish community of Spain move to Turkey they were sheltered there and nowhere else, not in Europe. I saw an inscription about Sultan Suleyman helping to rebuild the Jerusalem wall, so we are talking about deep rooted relationships between people. This is actually true about all people but especially Jews and Muslims. It is actually not easy to justify any confrontation in religious terms. You have to have imagination to do that but it is especially difficult to do that with Muslims and Jews because culturally and religiously the two peoples are so similar. The Muslims are even closer to Judaism than to Christianity in terms of the simplicity of the religion. It is so easy to focus on the differences but in reality there aren’t that many differences. There are some. HL: It has been my hope for many years that countries like Turkey would serve as a model for how Jews and the Muslims in that part of the world can get along and by what you are saying Azerbaijan is also setting a good role model for communication and how such relationships can and should be better. ES: Let me put it in a different sense. I wouldn’t call it a model. I would call it an example. I’ll tell you why. Every nation wants to be the model but every nation is different and nations’ conditions are different. Turkish history is very dear to our hearts but is very different from Azerbaijan’s. We have not been a major power. We have not been a Sultanate. We did not have that close a connection to the Arab middle east. But we had other aspects of our lives. We had cultural ties to Iran, the northern Caucuses and to Russia which Turkey doesn’t have to the same extent. But with both nations, and those of central Asia such as Uzbekistan, Kazakhstan and others, it is possible to set an example for others to follow. I saw a comment on our website which says, “how can we trust a nation that has a crescent on its flag?’ I thought about whenever I deal with the Swiss or Greeks or the British I don’t really notice the cross on their flags, or even if I notice it, those people have Christian heritage and good for them and why should I be trusting or distrusting based on that? If we go into basing our attitude on symbols we force ourselves into a corner from which we cannot get out. For instance, if you ask me to make a decision on a pragmatic basis, this is good or this is bad, this is fair or this is unfair, you could do that. But if you say you only have to make a decision because you are Muslim, you give me no choice. Nobody is going to step back from their faith. The best testament to that are the Jewish people. For more than 2,000 years they did not betray their faith. They did not step back. We should think about how we make decisions that are merit based and not religious based. HL: Tell me about the Jewish community in Azerbaijan. ES: The Jewish community mostly consists of two parts. One part is a very ancient group going back about 2500 years. Most of them were concentrated in a place called Quba. It is in a mountainous area. Many people made Aliyah from there and some came back. We have a direct flight to Tel-Aviv and Haifa is a sister city to Baku. So Haifa is where there is the greatest presence of the Azerbaijani community. That is a Jewish community that is Sephardic and is long standing and been there forever. An additional part of that is the Ashkenazi community which exists mainly in Baku and is well represented in our society. That community also has deep roots but it multiplied greatly during the pogroms when many Jews, mostly from the western part of Russia, escaped to Azerbaijan. Now think about that. Jews are being attacked in the western part of Russia and they go to a Muslim nation for refuge. This was during the Soviet years as well. I talked to the Jewish community and they said, even during the Soviet years they were never discriminated in Azerbaijan. In an article in Haaretz we have been referred to as a land with no anti-Semitism. But why would there be anti-Semitism? These people have lived shoulder to shoulder with the Azerbaijanis. They have contributed enormously. Jewish people in Azerbaijan have always been a part of our lives. The have been members of the Cabinet, members of the Parliament. Azerbaijani Jewish men have fought for the integrity of Azerbaijan. They are good doctors, teachers, leaders … what would be the reason for not liking each other? HL: What is tourism like between Israel and Azerbaijan as well as American Jews and New Yorkers and Azerbaijan? ES: In addition to direct flights by Azerbaijan airlines and Tel-Aviv, there is also a family connection for so many people resulting in continual travel between Israel and Azerbaijan. In fact the travel back to Quba has resulted in a great desire for those living in Israel to buy real estate in Quba, which is a relatively small area, causing home values to increase. In New York we have Jewish groups visiting. We have AJC and Conference of Presidents delegations. We have AIPAC, National Committee of Soviet Jewry. There is no direct flight yet so Turkish Airlines, Lufthansa and British Airways are convenient ways to travel until a direct flight between Baku and New York will be established in the near future. When I talk to people they say they do travel to Israel and from there to Azerbaijan. Our country has become very popular for its spas and skiing in the winter. We have a high priority goal to become an elite tourist destination and that should appeal to all travelers including those from America. When the Ambassador inquired about my background and I said I was from Brooklyn he thought because I spoke some Turkish I had roots there. I did have a good Turkish friend in college, a great volleyball player, and when the Peace Corps offered to send me to Turkey I readily accepted. I mentioned that the thought of Turkey being a Muslim country never entered into my decision and he said, “Why should it?” By the way, Suleymanov remarked that Azerbaijan is among the best countries in volleyball competitions. ES: The troubles with Turkey and Israel are short term. Turkey’s success is important for our region and for the entire Middle East. HL: What are some other things you would like my readers to know about your country? ES: We were the first established democratic republic in the Muslim world. We insured that women in our country had rights, even earlier than in the United States. We assisted America and the West by supplying troops to Kosovo, Iraq and Afghanistan. We have always insisted to America that our commitment is a long time commitment to see that Afghanistan succeeds as a nation. We can’t just enter and then leave, that’s not how it works. Azerbaijan is a reliable ally and stands by its word. Our relationship with both the United States and Israel is genuine. We are a staunch opponent against radical and terrorist groups. Viewing things in terms of Christian vs. Muslim becomes misleading and nonsensical and we need to be careful not to get into stereotypes. The best way to avoid deception is through proper education. Azerbaijan has created beautiful cities with parks, recreation and good schools. Baku is one of the most beautiful cities in the world today but it didn’t happen just on its own. It’s a clean city with good infrastructure, new buildings, people live in a more prosperous society and I say, you think it all just happens by coincidence? No. HL: Are you concerned about being a target of terrorism? ES: God forbid. I would hope not. We work with our citizens so they would not have a reason to be a part of that. I don’t believe we have domestic reasons for that. But nobody is immune to what occurs from the outside. One piece of advice to our American friends is instability breeds this kind of danger, so be careful. Unfortunately some attacks in Azerbaijan came from sources not necessarily known in the west such as Armenian terrorists. HL: is Azerbaijan an excellent place for American investors to consider? ES: Absolutely. Just look at energy development. In 1994 we signed an $8 billion 30 year agreement with the Soviet Union. Even though today we could and are signing much agreements on much better terms for us, it is now 19 years later and we have stuck to it, not changing a word. Abiding by our commitment is how we do business. Now we are moving to areas of telecommunications, internet and transportation, not just an energy center. We just sponsored the Eurasian Connectivity Alliance pushing for more connectivity. There are great opportunities for American companies in those areas I just mentioned as well as in agriculture. We have a very favorable tax for investors. We have a company called the Azerbaijan Investment Company that co-invests with foreign companies including matching investments. Hardly anyone becomes an overnight millionaire but if a businessman is looking for long term, steady and reliable growth Azerbaijan can provide that. It is a great opportunity to enter a new region and those who have done this have benefited immensely. HL: Ambassador Suleymanov, I appreciate you reaching out to our Jewish audience and being so open and informative and I look forward to working together in the future.